A suite of six pieces for guitar and percussion. Composed and performed by Clara de Asís. Review by Marc Medwin, Dusted Magazine, March 2018.
Review by Brian Olewnick, Just Outside, April 2018.
Review by Nathan Thomas, Fluid Radio, April 2018.
Review by Ben Harper, Boring Like a Drill, April 2018.
Review by John Eyles, The Squid’s Hear, August 2018.
Review by Peter Margasak, Chicago Reader, August 2018.
Review by Julian Cowley, The Wire, September 2018.
Review by Grégoire Bressac, Revue & Corrigée, September 2018. Do Nothing featured at National Sawdust On the Record column, February 2018. Feature at Luka Zagoričnik’s emission at Radio Študent, Slovenija, April 2018. Do Nothing included in Bill Meyer’s “Best albums of 2018”, Magnet Magazine, Dec. 2018. “The center cannot hold,” warned W. B. Yeats nearly a century ago, and Clara de Asis seems to ask, “Why should it?” In her transparent, often languid and occasionally harrowing music, each sound is the center, sometimes sustaining and sometimes not, from which levels and degrees of development are perceptible. From any conventionally analytical perspective, nothing is happening in this music, and that’s the point. Though there is bone and muscle a-plenty in these stark sounds, she is no post-Yeatsian end-of-existence prophet. Her music avoids the struggles of human agency while somehow embracing the elements that shape them. The closest comparison, at least for the sections of this album containing tonal centers of any sort, is to Alvin Lucier’s post-Cageian universe of tones in pulsing conflict and resolution. Upping the ante, Asis applies a Webernian concision to the sound, a kind of pointillistic repetition achieved by a simple guitar harmonic or the gentle strike of what sounds like a Tibetan singing bowl. Instead of Lucier’s long-form drama, the sonic events are brief, clear and punchy. Each tone is rife with overtone, sharply attacked or bowed into a state of resonant metallic frenzy. Two objects touch, briefly but poignantly, allowing internal resonance and external vibration to play a role in the growing network of tone and color emanating from a single center. Rarely does an easily identified layer of Lucierian pulse emerge; usually, beats are myriad and complex, rushing past each other to inhabit the same sonic space only to disappear. The piece titles reflect and dismiss these conflicts. Each supposedly juxtaposes action and inaction, two-word meditations on permanence, cognition or existence. What seem at first to be directives —“Do Nothing” and “Know Nothing” — might also embody states of being beyond agency. This is not music derived from Samuel Beckett’s action-driven notions of nothing struggling to become something or what is alive never quite being able to die. For Asis, no such conflict exists; listen to the second part of “Nothing Lasts” for her vision in distillation. Naming the sound is subordinated by its process of becoming, by the components of which that becoming is formed, but the becoming is itself a disappearance. The center does not hold, gradually dissipating as rhythms disperse, allowing the music to fragment and fade toward a silence any Wandelweiser composer would embrace. It is to her credit that Asis channels the well-worn trope with an individual voice. What is ‘nothing’, exactly? Surely it’s impossible to define — for to ascribe qualities to it, to say that it’s like this or like that, is to turn it into a thing, which is precisely what it isn’t. It’s tempting to try to define nothing negatively, by articulating all of the things it’s not; but as such a list is infinite, this too becomes an impossibility. I’m reminded of Daniel Linehan’s dance piece “Not About Everything”, in which he continuously spins on the spot while naming everything the piece isn’t about. He inevitably exhausts himself well before he is able to get to the end of this infinite list, thereby simultaneously revealing the impossibility of a ‘pure’, conceptless dance and opening the dance up to the world. Nothing is often thought of in terms of absence or lack, as a place where no thing is present. But it might also be considered a sort of caesura within each and every thing — a ground upon which being becomes possible, the zero added to every number. From this latter perspective, to hear nothing is not deafness, but rather an attentiveness to that within every sound which is not sound, but without which there would be no sound. To say “there is no such thing as nothing” is not necessarily at odds with saying “nothing is what makes every thing possible”. Linehan’s dance really can be about nothing and everything at the same time. Such apparent contradictions make little sense to the intellect, but fortunately they are easier to grasp with whatever faculty it is that wraps up sensory perceptions into what we call the aesthetic. May I offer up Clara de Asís’ solo album “Do Nothing” as an example? Not as a demonstration of a principle, exactly, but as an intriguing case study. The artist rejects the thought that the music may be reduced to the elucidation of an idea, however complex or subtle; rather, during the compositional process she was interested in “what happens in between” two actions, and that “the way to make that life come out was by doing nothing”. For the first piece, from which the album derives its name, “doing nothing” initially means isolated, repeated guitar notes, crystalline and pointillist in character. The space around the notes is too brief to draw attention to itself, instead highlighting the notes’ shape, or what audio engineers call their envelope — the way they begin from nothing, achieve fullness, decay and fade, and set other objects and the air around them resonating as they do so. The notes are joined by tings from a metal bell or bowl; when both guitar string and bell are struck simultaneously, the sound is transformed in a way that suggests some sort of physical interaction between the two. What I really, really like about this piece is the way in which it develops a depth of complexity without losing its surface simplicity: however quickly the numbers come, I can still hear the zero added to each. The handful of small chinks that close the piece are immensely instructive: their more extreme isolation and the brevity and abruptness of their envelopes shifts attention away from them onto the silence that surrounds them. Nowhere on the album is nothing more palpable than here. A continuous gentle clattering characterises second piece ‘Know Nothing’, little mechanical whirrings, creakings, tappings, and poppings creating a sound world strangely reminiscent of a hydrophone recording. This kind of sound recurs later on in ‘Nothing Lasts II’, albeit in a softer, hissier form, like rain on a roof. The first part of ‘Nothing Lasts’, meanwhile, is a faint and airy high-pitched glimmer, obscure in origin and in substance. Repeated guitar notes return for ‘Say Nothing’, though here the timbre is different, duller but with more ring; there is greater variation in timbre depending on how cleanly the guitar note is plucked, pronouncing the same note differently each time. I like the interplay between the guitar and the bowed metal in this piece, echoing the simple complexity of the album opener. What I experience listening to “Do Nothing” is that nothing is not the same as silence, if we define the latter as simply the absence of sound. To be sure, there is plenty of this kind of silence to (not) be heard across the album, but the selective range of well-chosen sounds don’t come across as the ‘something’ to the silence’s ‘nothing’, at least not to me. Rather, it feels as though nothing is always there, in the sounds as much as the silence, and the album’s greatest achievement amounts to making room for it, acknowledging its presence rather than trying to banish or exclude it. If that reads as contradictory or nonsensical, then, well, that’s not a problem you should let put you off — this is nothing you simply have to hear. This is the third release I’ve heard from de Asís, including ‘Uno Todo Tres’ (Éditions Piednu) and her collaboration with Bruno Duplant, ‘L’inertie’ (Marginal Frequency) and each has been a delight. Six pieces with de Asís playing guitar and percussion, titularly organized around the idea of nothing, each with a different approach. The works are very intimate, even very precise within the parameters she’s apparently assigned, like carefully limned drawings where the beauty is in the close attention to detail and where the complexity emerges from seemingly simple objects like stones and twigs. The title track offsets clear, ringing notes from the guitar, sometimes doubled, with the eventual introduction of a resonant, struck object, perhaps a bell. The two sounds, plus an alternate, slightly buzzing guitar tone, share the space, exerting a subtle gravitational pull on one another, their hanging tones causing ripples of interference. Meditative, alive, shifting and lovely. ‘Know Nothing’ changes locale drastically, plunging into a tiny world of skittering sounds that resemble, small sewing machines or teletypes, rapid-fire but soft, something like typewriters. There are two takes of ‘Nothing Lasts’, I and II. The first involves sliding, metallic objects, a kind of sound that I can listen to pretty much forever, while the second uses a similar structure but with what sounds like multiple gentle attacks on a drum head, perhaps even rain–entirely absorbing. Sandwiched between those two tracks is ‘Say Nothing’, repeated, deep guitar tones, regularly spaced, embedded in some amount of room tone, joined after several minutes by (guessing) bowed, large bells. It’s a darker variation on the first track, the bowing fairly harsh, the guitar less glowing. The final piece, ‘Be Nothing’, is built around what I think is bowed metal, though maybe a guitar is in play. It begins a swirl with overtones, slightly strident, the purer tones playing off the grainier ones, then slowly subsides, damping down the volume, becoming nothing. A very impressive offering from de Asís; can’t wait to hear more. The Spanish-born composer and guitarist Clara de Asis says that she is from a town where ‘guitar’ is synonymous with ‘flamenco’. In her early teenage years, she had guitar lessons for under two years, then continued on her own; she considers herself an autodidact. At university she did a cinema degree but, after graduation, moved to France where she studied electroacoustic music composition for a couple of years. Although de Asis has collaborated on recordings with such luminaries as Noel Akchoté, d’incise, Bruno Duplant and Golem Mecanique, Do Nothing is very much a solo effort, featuring her completely alone, credited with everything from playing guitar and percussion to composition, mixing and even cover photography. De Asis conceived the album’s six pieces as a set, as is indicated by their connected titles — “Do Nothing”, “Know Nothing”, “Nothing Lasts I”, “Say Nothing”, “Nothing Lasts II”, “Be Nothing” — a list that could have been designed to promote philosophical discussion on the nature of doing, being and nothingness! If the titles suggest a nihilist world-view, that is not reflected in their music which tends to be well conceived and executed, economical and engaging. So the title track, which opens the album and is its longest at twelve-and-a-quarter minutes, begins with a series of single acoustic guitar notes separated by gaps of roughly fifteen seconds, long enough for each note to resound, fade away, be savored and leave the listener anticipating the next one; gradually, the sounds become more complex, firstly with two notes being sounded close together, then three and then with ringing percussive sounds (most probably from a Tibetan bowl) being interjected, until eventually the piece has evolved into an enthralling call-and-response dialogue between guitar and percussion, without any silences. As effective is the ten-minute “Say Nothing” which again pairs guitar and ringing percussion — bowed metal, this time; it is different enough to avoid being a reprise of “Do Nothing” but is recognizably from the same source. Markedly different but just as typical are the two shortish takes of “Nothing Lasts” which have durations within seconds of one another and are unmistakably versions of the same piece; the two employ different sounds — maybe agitated springs in the first, a scraped snare drum in the second — but in each case the sound is repeated and overlaid to create a dense soundscape that is easy to listen to and repays repeated playing. The same applies to the entire album, which has a pleasing consistency to its sounds and concepts. It demonstrates that de Asis has a great deal to offer and whets the appetite for further installments. Marseilles-based Spanish composer and musician Clara de Asís delivers six lucid and often meditative works for prepared guitar and percussion on 2018’s Do Nothing. The title piece collides subtle harmonies from patiently plucked strings and the sustained ringing of what sound like Tibetan singing bowls, while “Know Nothing” simmers gently with anonymous machinelike chatter. The remaining pieces meticulously, sculpturally arrange similar materials with crystalline directness and delightful abstraction. Clara de Asís grew up in a Spanish region where the acoustic guitar and flamenco were synonymous. Now based in France she uses acoustic guitar and percussion to make an idiosyncratic and personal music that avoids flamboyance and jettisons embellishment. ‘Nothing’ features in the title of each of these six tracks, which are pared back to a point where only essentials seem to remain. Bell-like harmonics; shimmering bowed metal; the muted clatter of a typewriter; liquid whistling; the rattle of a distant train; the wavering halo of a moistened wineglass. De Asís delivers music that is actually far from parsimonious. In terms of unexpected timbres, textures and nuanced coloration these are gentle yet generous compositions offering a stream of satisfying disclosures. 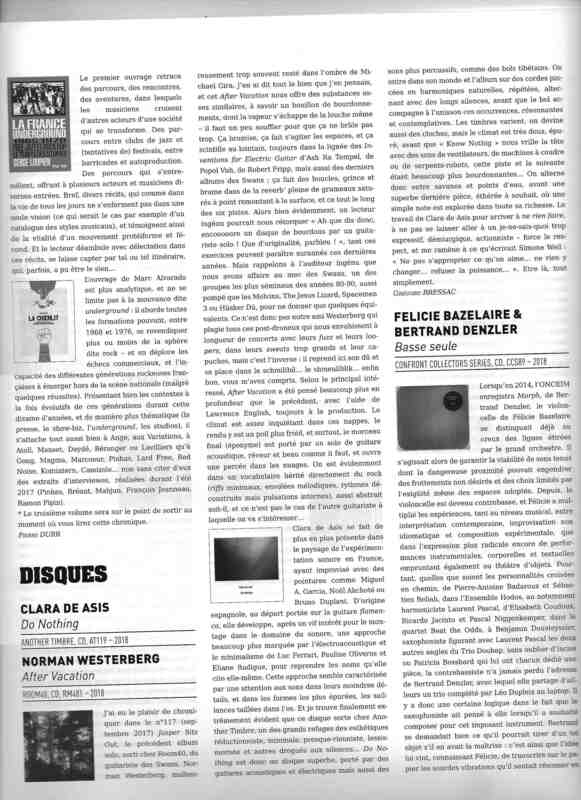 Clara de Asís se fait de plus en plus présente dans le paysage de l’expérimentation sonore en Frane, ayant improvisé avec des pointures comme Miguel A. García, Noël Akchoté ou Bruno Duplant. D’origine espagnole, au départ portée sur la guitare flamenca, elle développe, après un vif intérêt pour le montage dans le domaine du sonore, une approche beaucoup plus marquée par l’électroacoustique et le minimalisme de Luc Ferrari, Pauline Oliveros et Eliane Radigue, pour reprendre les noms qu’elle cite elle-même. Cette approche semble caractérisée par une attention aux sons dans leurs moindres détails, et dans les formes les plus épurées, les saillances taillées dans l’os. Et je trouve finalement extrêmement évident que ce disque sorte chez Another Timbre, un des grands refuges des esthétiques réductionniste, minimale, presque-rienniste, lessismoriste et autres drogués aux silènes… Do Nothing est un disque superbe, porté par des guitares acoustiques et électriques mais aussi des sons plus percussifs, comme des bols tibétains. On entre dans son monde et l’album sur des cordes pincées en harmoniques naturelles, répétées, alternant avec des longs silences, avant que le bol accompagne à l’unisson ces occurrences, résonnantes et contemplatives. Les timbres varient, on devine aussi les cloches, mais le climat est très doux, épuré, avant que « Know Nothing » nous vrille la tête avec des sons de ventilateurs, de machines à coudre ou de serpents-robots, cette piste et la suivante étant beaucoup plus bourdonnantes… On alterne donc entre savanes et points d’eau, avant une superbe dernière pièce, éthérée à souhait, où une simple note est explorée dans toute sa richesse. Le travail de Clara de Asís pour arriver à ne rien faire, à ne pas se laisser aller à un je-ne-sais-quoi trop expressif, démiurgique, actionniste – force le respect, et me ramène à ce qu’écrivait Simone Weil : « Ne pas s’approprier ce qu’on aime… ne rien y changer… refuser la puissance… ». Être là, tout simplement.